These single serve apple crisp is perfect if you are looking to control portion size or you just don't want to have a big leftover pan of scrumptious apple crisp looking at you in the fridge everyday. It wouldn't be easier with most of the flavor coming from instant oatmeal packets! Preheat oven or toaster oven to 350 degrees. 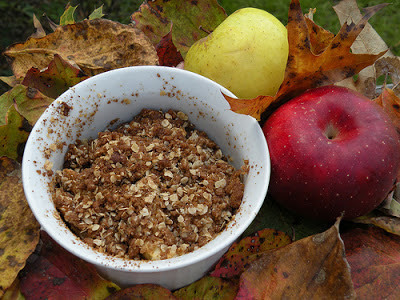 Coat the apples in the sugar, nutmeg and cinnamon and place in a ramekin or single serve dish that is safe for the oven. In a small bowl, mix the oatmeal with the butter until combined and the butter and oatmeal are in small chunks. Sprinkle over the apples and bake in preheated oven for 15 minutes. Serve with vanilla ice cream and enjoy! Yes sir-ree! That's for me! I would love more single serve dessert recipes.